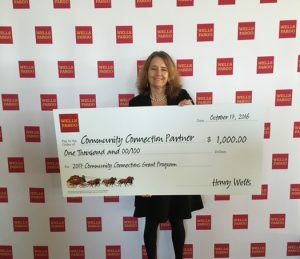 Montessori Children’s House in Horsham is honored to have been chosen to receive a $1,000 grant from the Wells Fargo Community Connection Program. The Wells Fargo Community Connection Program is an annual program where each of its retail banking stores explores the needs of their local communities and selects a nonprofit organization or school to receive a $1,000 grant. This year, Wells Fargo will award more than $300,000 in grants to nonprofit organizations and schools throughout Pennsylvania and Delaware. The grants are part of the company’s broader support of its communities. In 2015, Wells Fargo and its team members invested more than $11 million in nonprofit organizations and schools and team members volunteers more than 36,000 hours across Pennsylvania.